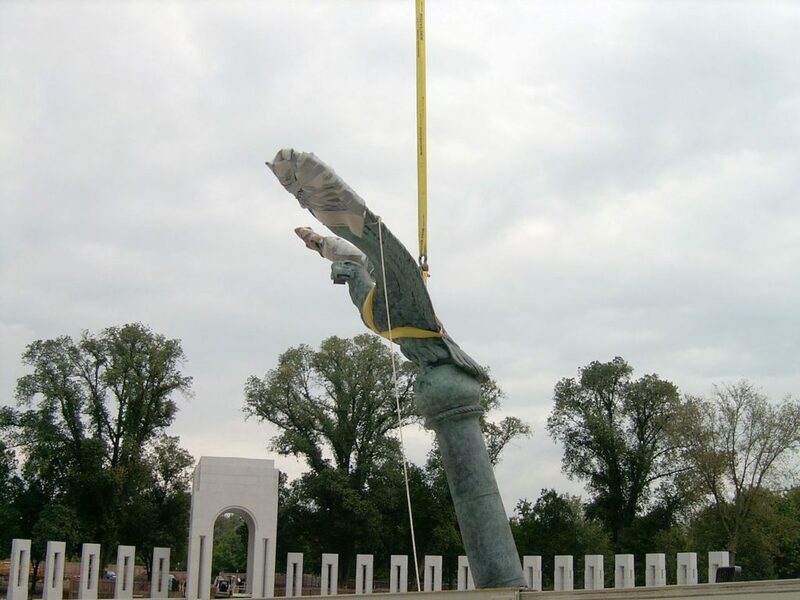 In 2001, APEX Piping Systems, Inc was honored to be selected as one of the contractors for The National World War II Memorial in Washington D.C. Our work consisted of the fabrication of the stainless steel armatures to support the eight monumental bronze eagles and two laurel wreaths, in addition to their installation in the Atlantic and Pacific Pavilions of the Memorial, where they can be seen today. The National World War II Memorial is flanked on either side by large Pavilions, representing the Atlantic & Pacific theaters of the war. Each Pavilion houses a 32’ high, bronze sculptural canopy consisting of a massive laurel wreath suspended overhead by a ribbon, carried by four bald eagles each perched upon their own column. 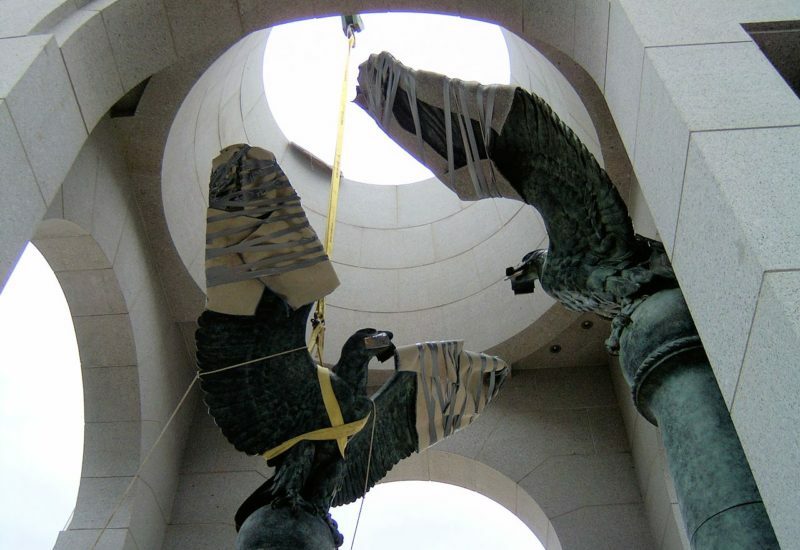 The bronze sculptures that created these canopies required stainless steel internal support in order to be securely integrated into the monument. 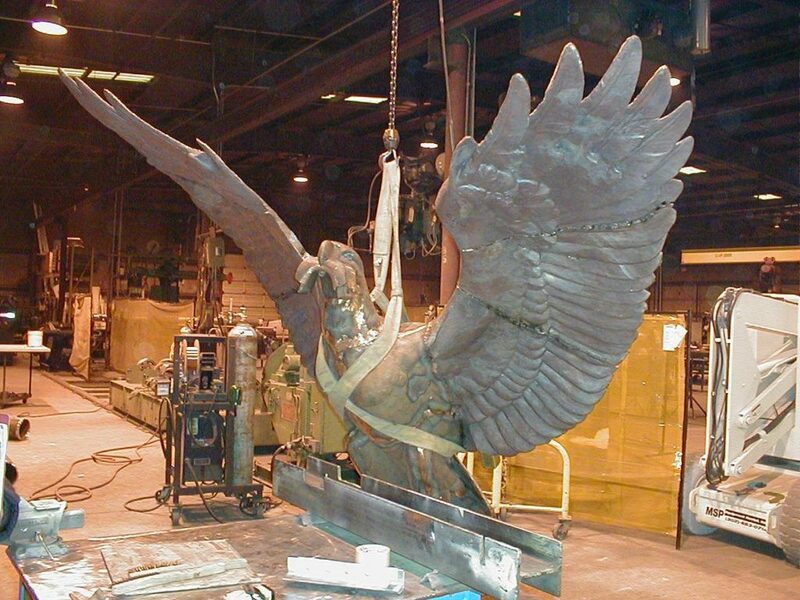 APEX built of a total of 8 stainless steel armatures to create the “skeleton” around which the eagle would be sculpted. 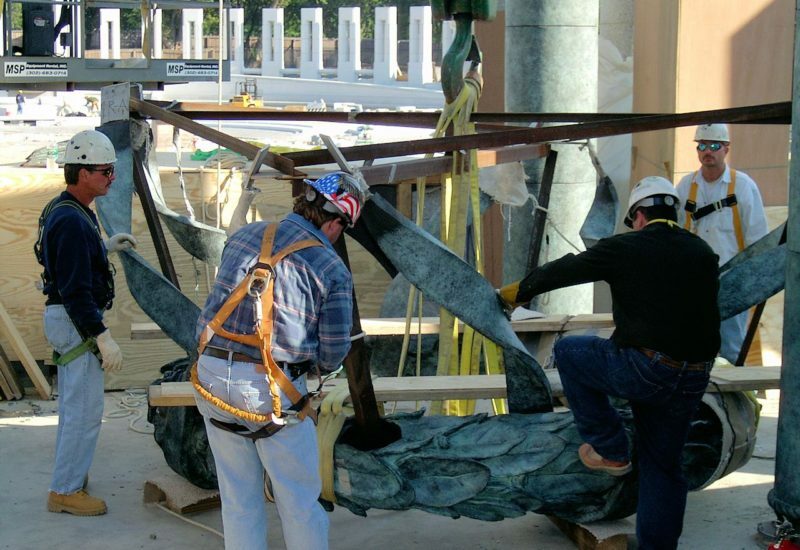 This was no small feat as the structural support needed to be made small enough to fit within the dimensions of the finished sculpture, each one customized to match the artist’s vision as well as the variations that occur when using bronze as the medium and strong enough to help support the 3500 lb laurel wreath! Each armature was fabricated from 38 separate pieces of stainless steel pipe & plate welded together and set upon a stainless steel column. The next challenge came with fabricating the ribbons for each canopy, as they needed to have the visual characteristics of a fabric ribbon but were required to be fabricated from 2” x 6” stainless steel plate to be strong enough to support the weight of the 3500 lb wreath it would help support. To achieve this, APEX designed and built specialty equipment to cold-forge the 2” x 6” stainless steel plate from a straight piece of metal into what appears to be a softly curved, bent and billowing ribbon, wrapped gracefully around the laurels. 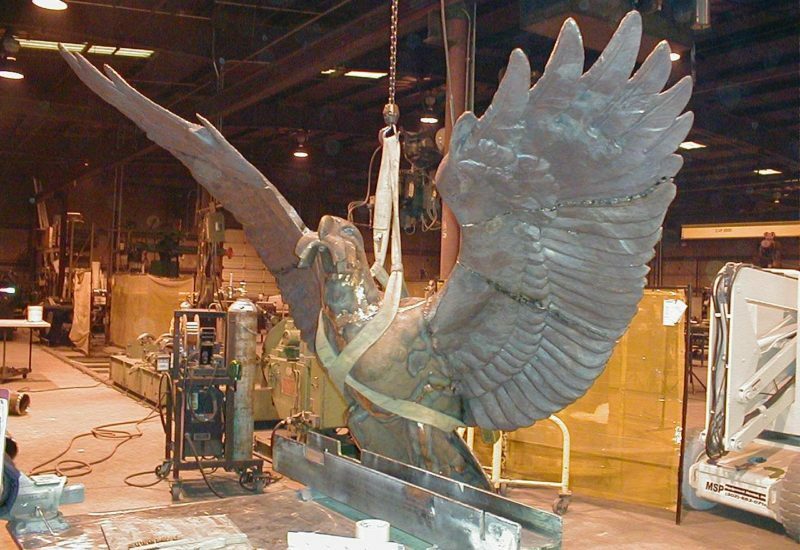 The “ribbon” was then welded to each eagle’s armature at the beak, creating the support required for the weight of the wreath. 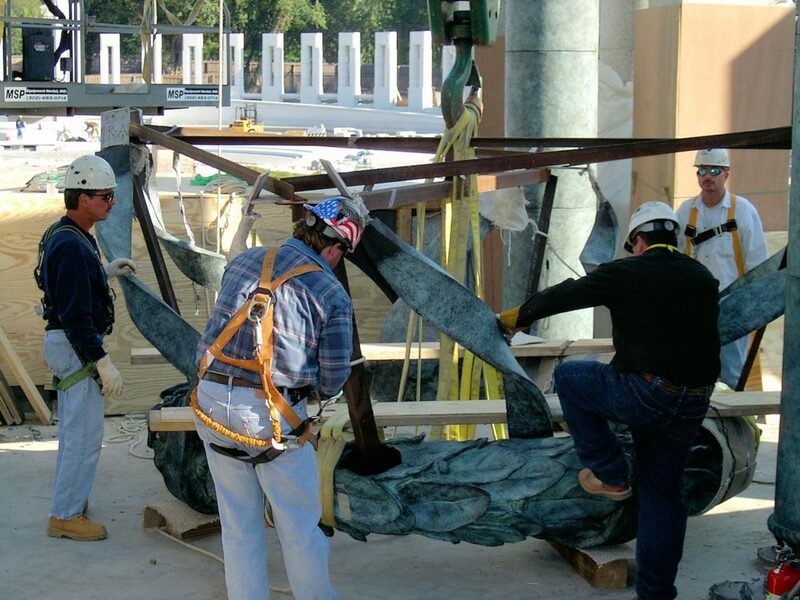 Having successfully completed a trial run of the installation, the finished canopy statues were shipped in pieces to the site for installation. The site was well underway when our team arrived in Washington D.C. The two granite Pavillions, in which the canopies would be housed, were fully erected. They stood 43′ tall with a (slightly larger than) 10′ diameter opening in the roof, allowing natural light to enter the space. One column with an eagle perched atop would sit in each of the four corners of Atlantic and Pacific Pavillions, the wreath suspended from their beaks and in line with the roof opening. 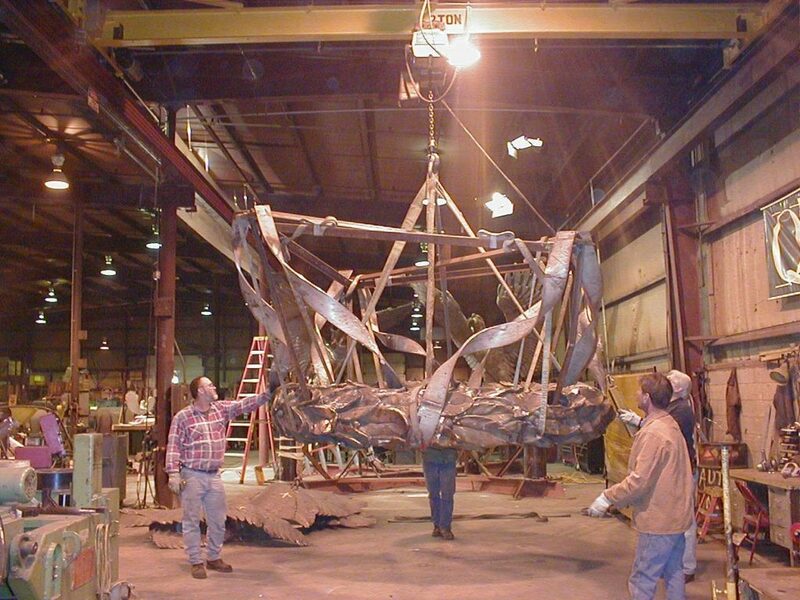 With the eagles welded to their perch, they measured approximately 32′ tall and had a wing span of 10′. APEX’s rigging crew worked with local crane operators to set the 8 eagles (4 per pavillion). 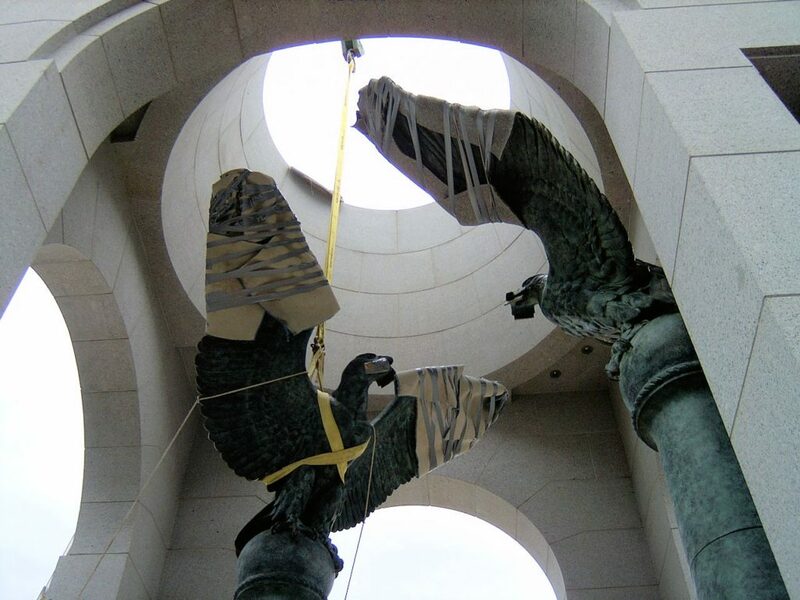 These 32′ tall, 10′ wide bronze sculptures were hoisted into the air, soaring over the memorial, and lowered through the tops of the Pavillions, which were only 3″ larger than the eagles’ wingspan! With a crew on the ground and one on the roof, the eagles were set into their permanent homes without incident! Next up were the laurel wreaths. These were hoisted over the Pavillions, lowered to the floor, aligned for fit up to each eagle’s armature and again hoisted so the ends of the ribbons met the armatures. Positioned roughly 30′ above the floor our team welded the ribbon and armature together; successfully concluding our work on this truly historic project! 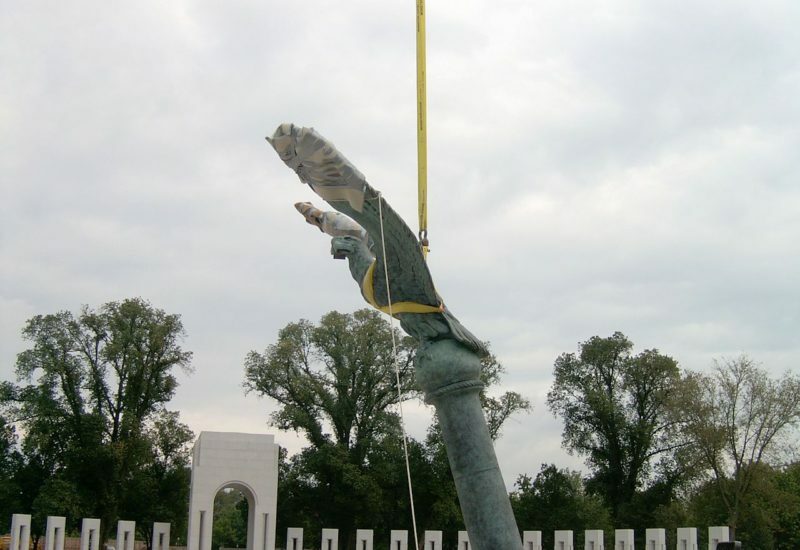 We were honored, once again, when APEX was invited to the May 2004 dedication ceremony held on the mall between the Washington Monument and the National World War II Memorial. The Memorial was more beautiful and moving than anyone could have imagined. It was a blessing to have been there that day, experiencing the space with the countless veterans in attendance. Emotions were high as families remembered loved ones lost but spirits were happy and lifted as the area was filled with people sharing, honoring and thanking our Veterans for their service. 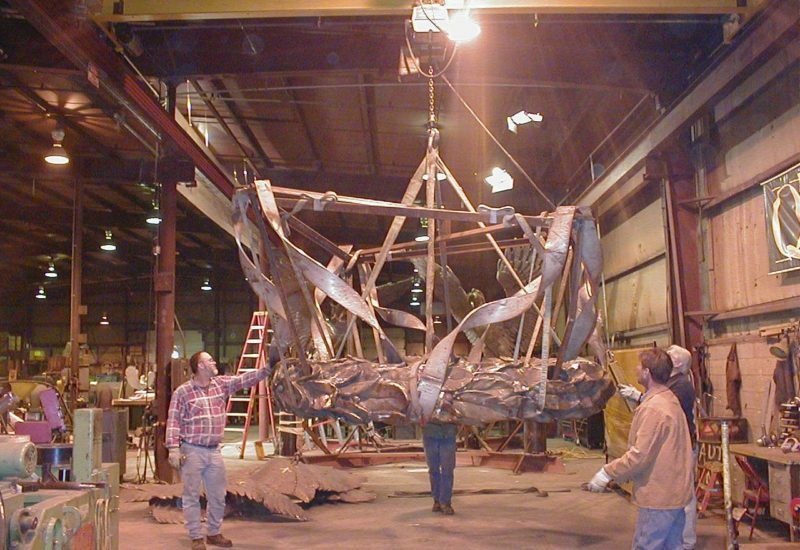 With the armature fabrication underway, APEX’s Newport, De fabrication shop became a hub, where those responsible for the sculpture, bronze casting and design for this part of the memorial worked together and shared ideas. During this time, the energy and excitement could be felt as soon as anyone entered the shop doors. 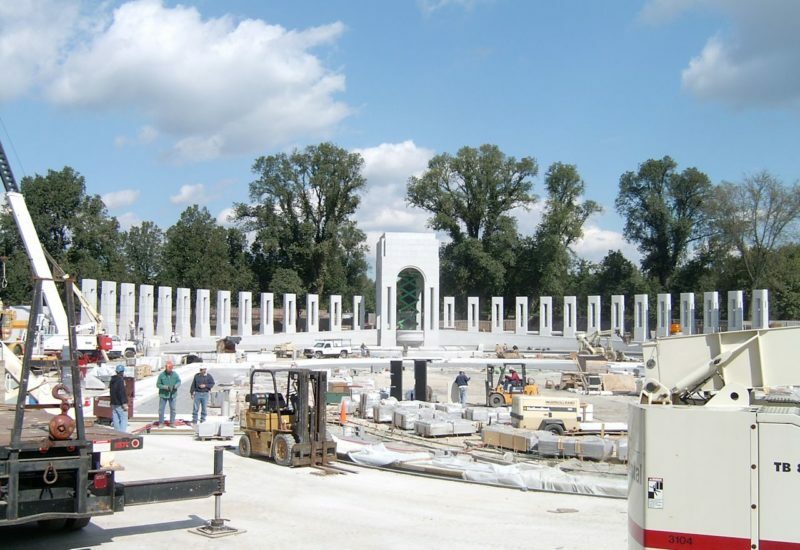 It was truly an honor to be working on such a historic project and, more importantly, one that would serve to honor World War II Veterans, many of whom were parents, grandparents, uncles and aunts of those involved in the construction. As a result, not only were our shop doors open to those working on the armatures and sculptures, they were open to those who were to be remembered and honored by this Memorial. 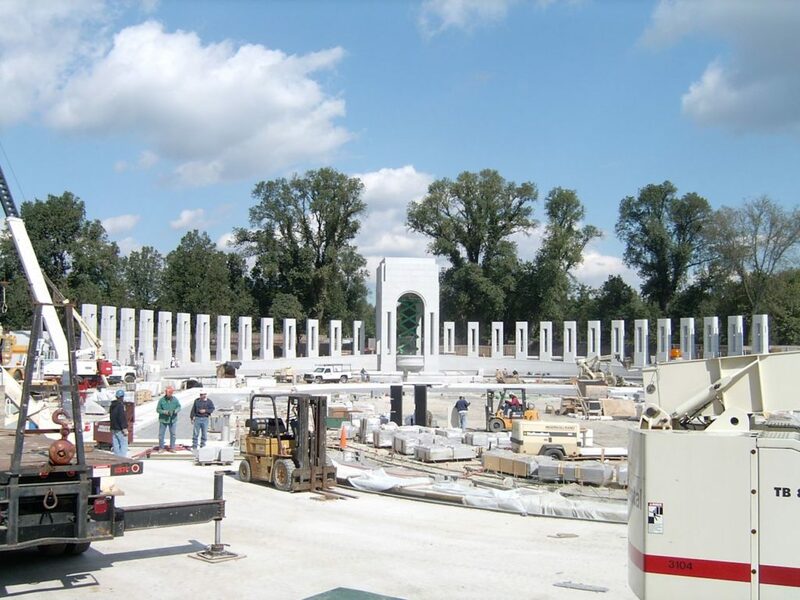 A monumental dedication ceremony was to be held in Washington D.C. in May, 2004 once construction of the Memorial was complete. However, it occurred to many working on this project that a number of the veterans the dedication ceremony would serve to honor may be unable to attend due to lack of transportation, illness or old age. It was decided that APEX would host a Visitor’s Day and Memorial Ceremony in our shop, before the Eagles and laurel wreaths were shipped to the construction site. Together, with Former Governor Ruth Ann Minner, members of her administration, representatives of our Armed Forces, the tradesmen, craftsmen and artisans that worked on the project, APEX opened its doors to, the local Veterans who were to be remembered and honored by this Memorial and their families. It was truly an amazing and emotionally moving experience, as these brave men and women, who sacrificed and served so selflessly, shared with us their stories, remembered their friends and signed the armatures before they were enclosed in bronze.